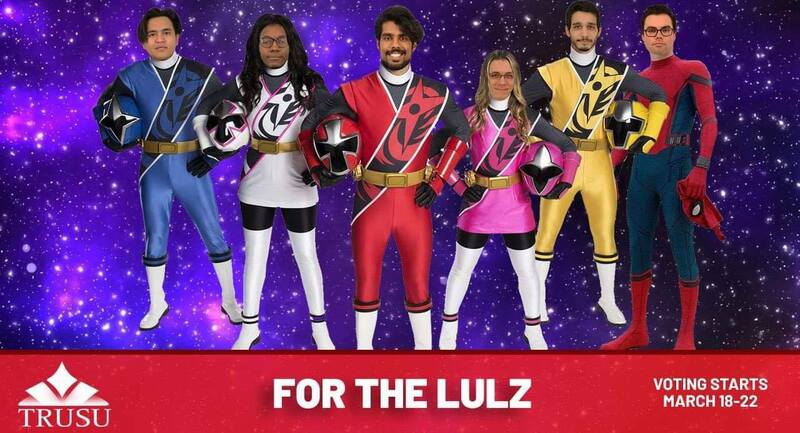 Among the new slates in the running for TRUSU governance positions for the 2019/2020 terms is one accurately called “For the Lulz” (FTL). FTL is fielding candidates in five positions: visible minority representative, entertainment representative, vice president internal, international representative and vice president equity and their candidates are an interesting group. The candidates of For the Lulz really bring the party into shape, however. “Once we sank that much money into the process we kind of had to make it real,” added Balageo. When pressed about some of the biggest issues with TRU, entertainment rep. candidate Henry Albuquerque voiced his concerns around some issues on campus. Other members of the slate voiced appreciation and agreement with the solution. So jokes aside, what would For the Lulz do if they won their elected seats? But is the joking mantra born of real concerns with the university? Many of the agenda items on their posters are issues frequently cited by students as negatively impacting the university experience (parking, tuition and fees, campus housing and food options). Balageo believes that although the party is mostly seen as a meme, they’re both satirical and very real. Looking past the jokes, For the Lulz are a group of students who seem to share a dissatisfaction with TRU with many other students. Win or lose, FTL has resonated with many students who are tired of TRUSU politics and the TRU quirks we put up with year round.